Many spacecraft have slowed their descents to Mars using large parachutes. 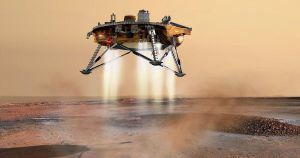 But landing heavier spacecraft on the Red Planet, like those with a human crew, will pose new engineering challenges, according to new research — and a potential solution could involve a harrowing nose dive. The paper Putnam co-authored about optimizing the trajectories that Mars landers should take on descent was published in the Journal of Spacecraft and Rockets. There’s another issue that comes along with larger rockets: more valuable space used up by additional rocket fuel. And that’s space that could be used for scientific instruments or even human passengers. Luckily, there might be a middle ground: pre-determined trajectories could minimize the need for massive parachutes or giant tanks of additional propellants to fire descent system rockets. To pull that off, the vehicle would have to dive down, then turn its nose up just at the right time to fly over the Martian surface at a low altitude. The post New Idea to Land Heavy Payloads on Mars: Dive, Then Turn Nose Up appeared first on Futurism.